Home > Products > ChargeIt by Jay Gold Baroque Charger Plate 13"
Provide guests with an elegant dining experience with the ChargeIt by Jay Round Gold Baroque Charger Plate 13". 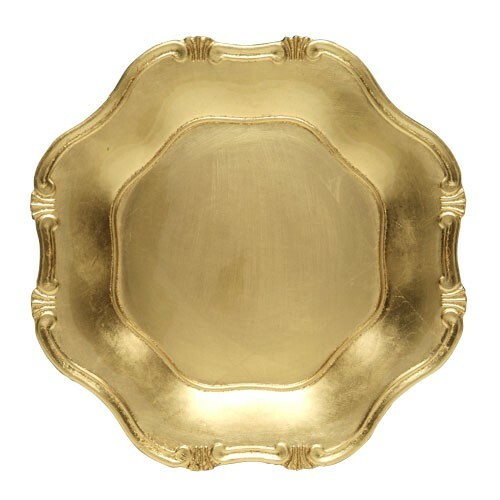 Accented with an intricate baroque design around its edge, this lavish gold charger plate is perfect for wedding receptions, upscale dinner parties, and banquets. Thanks to its high quality melamine construction, this round charger plate boasts a delicate look that belies its strength and exceptional durability. In addition, it is large enough to accommodate any size plate.